A living language becomes extinct every two weeks. The problem is often overlooked by speakers of the world’s major languages. When language extinction is considered, many otherwise thoughtful people shrug it off as a minor issue. This might be explained by the recent development of a misguided notion (some kind of socio-Darwinian view of linguistics) that an extinct language did not survive because it could not adapt to the changing environment and was dominated by more “fit” languages. Language extinction might then be written off as the result of the ‘evolutionary’ process of globalization. But this idea relies on a limited and flawed concept of language itself. As David Harrison pointed out in his recent lecture, the loss of language diversity is not an enhancing mutation. Each death of a language is more than just a loss in terms of cultural and historic heritage — it is an irreparable loss to the database of human knowledge. According to the recent Ethnologue report, 516 languages are classified as nearly extinct, and all of them can disappear in fewer than twenty years. Abom (15 speakers): Formerly spoken in a village in the Western province. After the village was abandoned, the villagers found their new home in the neighboring villages, belonging to different language areas. No children are known to speak the language. Dumpu (ethnic population of language area is 510; number of speakers is unknown): also known as Watiwa, spoken in six villages in Madang province. Although the language was used rarely in everyday activities, it was commonly used as a “secret language” when visiting the closest town. A few children use Watiwa to communicate with their grandparents. Gweda (26 speakers): spoken only in the village of Garuwahi, Milne Bay province. The age distribution of the speakers — ten speakers are under forty and two are under twenty years — provides hope that the language could survive. Pacahuara (Bolivia, 17 speakers): The primary occupation of the native speakers is rubber gathering in the tropical rainforest of the Northwest Beni region. Arikapu (Brazil, 6 speakers): a few active speakers reside in the headwaters of the Rio Branco. Most of the speakers have shifted to Portuguese. Tataina (the U.S., 75 speakers): spoken in a small area of southern Alaska. There are some younger speakers in their twenties residing in the Lime Village but the majority of the active speakers are much older. Tirahi (Afghanistan, 100 speakers): spoken only by the elderly in the Southeastern region of Jalalabad. Ainu (Japan, 15 speakers): spoken on the Kuril Islands and formerly on the Sahalin Island, Russia. At least 19 dialects of the language were recorded. Birale (Ethiopia, 19 speakers): spoken by the older hunters in a village on the west bank of the Weyt’o River. El Mono (Kenya, 8 speakers): spoken in a few fishing villages located on the Southeastern shore of Lake Turkana. Vod (Russia, 25 speakers): belongs to the Finno-Ugric language family; spoken in several villages located in the region between Northeastern Estonia and St. Petersburg region of the Russian Federation. The language has never been written down. Saami Pite (Sweden and Norway, 20 speakers): spoken in Lapland along the Pite river. There are no speakers left in Norway. Karaim (ethnic population of the language area is 5,000; number of speakers is unknown): spoken by the ethnic Jewish adherents of Karaite Judaism in Crimea, Lithuania, Poland and western Ukraine. The language is completely extinct in Israel and Ukraine. Photo by Eric Lafforgue. 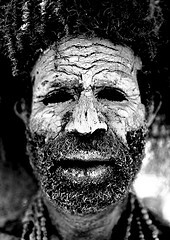 His book, Papous includes other amazing photographs from Papua New Guinea. I live in Ottawa, Ontario, and I hear rants from the French speaking people, claiming and thinking that their language is endangered. I don’t believe this for a second, because Canada has two official languages – English and French. I think the only reason the French “police” want to enforce language to be displayed is because of a few fussy and stuffy individuals who want and are desperate to have more people speaking French. I will not be surprised if someone from Quebec demands to have their language added to this list. What need to be the maximum number of people to be eligible to be added to this list? I’m also sure that the French in Quebec wouldn’t care if the Algonquin speaking peoples died out and the French language prevailed. Sadly, I’m afraid that that day will come. As professionals, can you please tell us if French is in any way endangered at the present time? Can you tell us if, in your opnions whether the agitators who use their claim of the iminent demise of French as an excuse to enact exclusionary laws about the lanuguage of busiess have ANY basis in fact for their claims? Or are they simply using it as an excuse to keep a significant population in the province of Quebec ignorant, isolated and maleable?